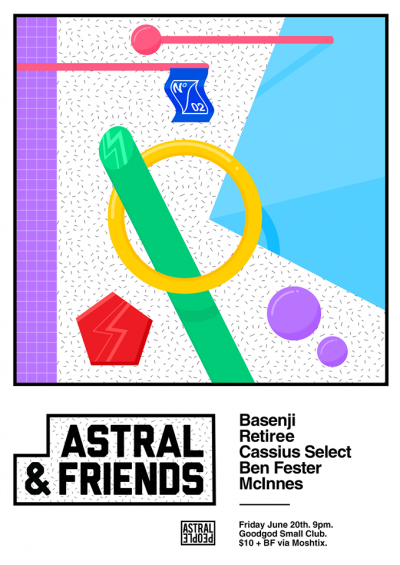 In March 2014, we launched Astral & Friends, a bi-monthly showcase of Sydney’s finest artists at Goodgod Small Club. Originally designed as an intimate affair, the entirely local lineup saw a whopping 500+ people come through the door; as good an indication as any that Sydney is out to support its own. A firm local favourite on the cusp of international stardom, Sydney archetype Basenji follows his Boiler Room performance on the verge of his debut EP release. Plastic World’s Retiree are set to bring their distinct live show once again to the stage following their successful debut EP tour earlier this year, with the evening’s tail-end helmed by the spatial-techno of Cassius Select and ever-sequenced DJ sets from Ben Fester and McInnes. Once again we’ll be featuring these promising artists in a setting that is high in calibre but light on the wallet. There will no doubt be new tunes and surprises a plenty, so we advise to get on board early.